Medal Race Contenders Ready For Battle in Qatar. Day 4 of racing at the 2010 470 Junior World Championships in Doha, Qatar delivered the best weather conditions of the Championship so far, which for many teams are the conditions in which they can deliver their better performances. Teams' weather preference was evidenced in the shift in teams securing improved results today. Four races were held today in the men's fleet to give a total of 6 races on the final day of qualification – a pressure filled race day. The women contested 2 races for a total of 7 qualification races. Yesterday was the day that the 10 teams which will proceed to the Medal Rounds in each of the fleets were determined and it was a tough battle out on the water. Andreas Kosmatopoulos (GRE) running the coaching clinic in Doha, Qatar. 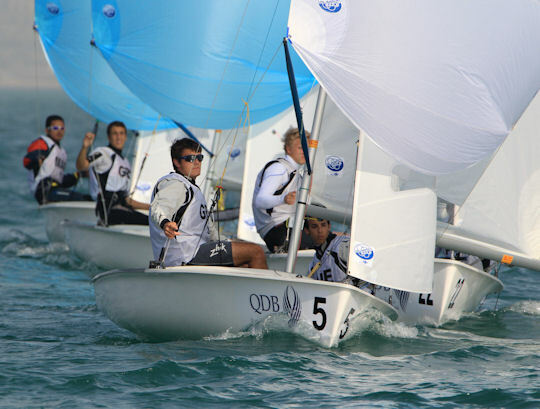 The 2010 470 Junior World Championships is a “pay and play” event with brand new supplied 470s. The concept of supplied equipment is a first time experience for many of the teams, and one which the 470 Class is keen to promote. 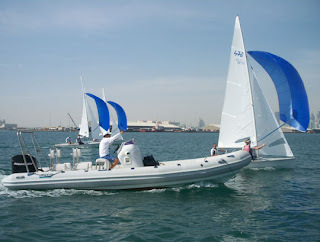 With supplied equipment, all teams compete on an equal footing with only minor adjustments allowed to settings as the boats are rotated between the two fleets.